In Creating True Peace, Thich Nhat Hanh uses a beautiful blend of visionary insight, inspiring stories of peacemaking, and a combination of meditation practices and instruction to show us how to take Right Action. An audiobook for people of all faiths, this is a magnum opus -- a compendium of peace practices that can help anyone practice nonviolent thought and behavior, even in the midst of world upheaval. 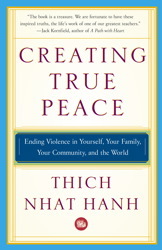 Creating True Peace tells stories of Thich Nhat Hanh and his students practicing peace during wartime. These demonstrate that violence is an outmoded response we can no longer afford. The simple, but powerful daily actions and everyday interactions that Thich Nhat Hanh recommends can root out violence where it lives in our hearts and minds and help us discover the power to create peace at every level of life -- personal, family, neighborhood, community, state, nation, and world. Whether dealing with extreme emotions and challenging situations or managing interpersonal and international conflicts, Thich Nhat Hanh relies on the 2,600-year-old traditional wisdom and scholarship of the Buddha, as well as other great scriptures. He teaches us to look more deeply into our thoughts and lives so that we can know what to do and what not to do to transform them into something better. With a combination or courage, sweetness, and candor, he tells us that we can make a difference; we are not helpless; we can create peace here and now.